tronic data interchange technology. Amal Aly is a lecturer in the Computer and Information Systems Department of. Sadat Academy for Management Sciences,. Keywords: Solar still, Solar Energy, Fresh Water, Submerged Absorber. 1. INTRODUCTION. 1. 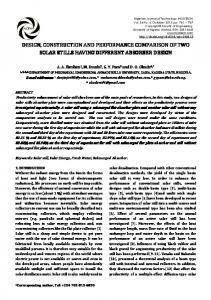 ... performance of an active solar still have been investigated . 1/2006. FOUNDATION DESIGN AND. CONSTRUCTION. GEOTECHNICAL ENGINEERING OFFICE. Civil Engineering and Development Department. lyzed to obtain a logical schema for the implemented phys- ical schema ... Schema conversion is the translation of the legacy data- .... A complete presentation of. Design, Construction, Meat, Poultry, Processing, OSHA, Concrete, Steel, International .... Selection of an appropriate site is an important consideration for the. The networking construction and management is the core technology in computer networking designs. .... It is an assisted study tool released by Cisco for. 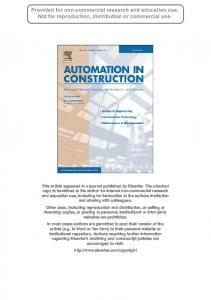 Abstract Automation technology can provide construction firms with a number of competitive advantages. Technology strategy guides a firm's approach to all technology, including automation. Engineering management educators, researchers, and construction industry professionals need improved understanding of how technology affects results, and how to better target investments to improve competitive performance. A more formal approach to the concept of technology strategy can benefit the construction manager in his efforts to remain competitive in increasingly hostile markets. This paper recommends consideration of five specific dimensions of technology strategy within the overall parameters of market conditions, firm capabilities and goals, and stage of technology evolution. Examples of the application of this framework in the formulation of technology strategy are provided for CAD applications, co-ordinated positioning technology and advanced falsework and formwork mechanisation to support construction field operations. 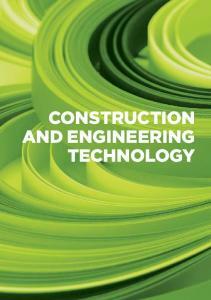 Results from this continuing line of research can assist managers in making complex and difficult decisions regarding reengineering construction processes in using new construction technology and benefit future researchers by providing new tools for analysis. Through managing technology to best suit the existing capabilities of their firm, and addressing the market forces, engineering managers can better face the increasingly competitive environment in which they operate. The increasing technical feasibility of automation for construction brings major opportunities and requirements to develop approaches for the most beneficial use of this technology in firms. Automation technology will compete with human resources and other technologies for investment of scarce resources to continuously improve performance in construction firms. What approaches will bring the most improvement in the competitive performance of individual firms? Whether explicitly stated or implicitly defined by managers' decisions and actions, the technology strategy for a firm guides the approach to all technology, including automation. Similar to human resource, finance, or marketing strategy, technology strategy is one of the functional strategies that support the competitive and corporate strategies of a firm. The purpose of this paper is to describe the elements of technology strategy for construction firms and apply these elements to the consideration of automation. competitive performance for infrastructure construction, and provide recommendations and techniques for analysis of technological alternatives and use of advanced technology to improve the competitive performance of construction firms. 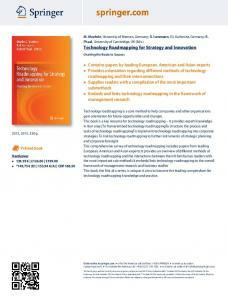 The classification for technology strategy used in this research consists of five key dimensions: competitive positioning, sourcing of technology, technological scope, technical depth, and organisational fit. Competitive positioning is the relative command of specific technologies and monitoring alternative technologies potentially available from other sources. Sourcing is the acquisition of explicit (hardware) and implicit (knowledge) technologies. The scope dimension identifies the core and peripheral technologies for the firm. Depth highlights relative level of investment and extent of technical capabilities. Organisational fit includes the match of reward systems with technological objectives, the flow of technical information, and the matching of capabilities to project requirements. Each of these dimensions guides the construction manager's approach to the acquisition and implementation of technology in reengineering construction processes. steps and options in formulating technology strategy, and the benefits for competitive performance of construction firms. Technology and Strategy For this research we define construction technology as the combination of resources, processes and conditions that produce a constructed product. A resource can be either materials and permanent equipment or a temporary addition by construction. 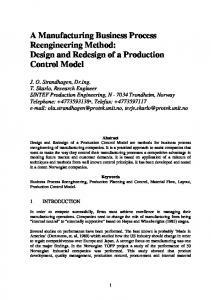 Construction processes are the methods and tasks needed to build a constructed product. 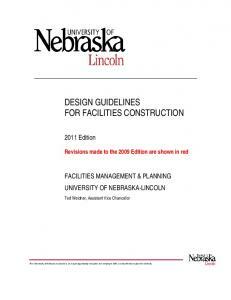 Project requirements and site characteristics are the major conditions of construction technology . competitive positioning refers to the role that technology plays in establishing generic competitive advantage or how product technology, process technology and technical support capabilities are used to achieve cost leadership or differentiation . Maidique and Patch  raise the managerial question of "what new technologies to add to the firm's core set of technological skills?" Three factors that guide strategy in an important technology are: sustainability of the technology lead, first-mover advantages, and first-mover disadvantages . sourcing of technology incorporates the dual (but overlapping) concepts of Burgelman and Rosenbloom's "Technology and the Value Chain" and the Malekzadeh et al "Sources of Technological Capability". To remain competitive a firm must structure ways to acquire certain value-creating technologies, i.e. the develop or buy argument. This decision to acquire new technology is, as described by Rosenberg et al , "inescapably an investment decision". a dynamic world, peripheral technologies can become tomorrow's core technologies and vice versa . depth of technology strategy encompasses the number of technological options the firm has available. The depth of a firm's technology strategy is determined to a significant extent by the intensity of its resource expenditures. Investment in technological resources is positively related to technical output . Expenditure on internal R&D has a strong relationship to increased profitability . organisational fit encompasses administrative and cultural factors of the firm. Patterns of technical communication throughout the construction organisation are important determinants to the quality of organisational fit. From the Burgelman and Rosenbloom  evolutionary point of view, organisational context serves as an internal selection mechanism affecting the strategic management of the firm. Burgelman and Sayles  suggest that reward systems provide potential measures of one aspect of the organisational context of technology strategy. can formulate a technology strategy that best fits the capabilities and culture of a firm and creates competitive advantages over its industry rivals. Competitive Positioning Automation technology can provide several types of competitive advantages. Examples include: offering new products in new markets, developing distinctive or unique competence, serving a niche market, reducing project durations, and decreasing life cycle cost . Analysis of customer needs, types of contracts, and external influences on markets provides a basis to select a type of competitive advantage for a firm. This analysis can identify the competitive advantages that are desirable for the market conditions and feasible for the specific firm, together with the types of technologies that can provide this advantage. Automated positioning technology can provide advantages based on offering new products in new markets or developing distinctive competencies. For example, applications of automated positioning in the grading and paving industry could allow the accurate preparation of pavement subgrade and base, and permit placing the asphalt or concrete wearing surface to comply with more stringent tolerances for pavement location and surface finish. The high cost of concrete grinding and set-up labour for traditional equipment encourages use of this type of positioning technology to decrease total construction cost. Unique or distinctive competence can also be achieved within the concrete highway bridge construction sector through the development of mechanised falsework and formwork systems that address the industry drivers of labour cost and operational safety. For example, a series of fabricated steel trusses that efficiently combine the traditional functions of falsework and formwork and allow construction of a new double-deck freeway level to proceed over an existing busy highway provides clear competitive positioning advantages for its owner— especially when the investment in this more advanced construction mechanisation is carried out during the development of this type of continuing work. The entire system could also include prefabricated internal formwork and incorporate concrete placing and finishing equipment—all enclosed by debris panels to allow construction to proceed safely during normal working hours. When future project phases of a similar nature are bid, the strategic early investment in labour-saving construction automation/mechanisation can provide unmistakably clear first-mover benefits. Several options are available to acquire new technology for automation. These include: interact with a lead developer, conduct internal development, improve processes for repeated operations, drive technology development on specific projects, and interact with owners and operators . These approaches involve plans and commitment of resources to acquire a new technology and effectively use it. The most critical resources are not always financial— commitment of time by operations managers or field staff may be more important criteria for success than funds. Several different approaches for acquiring CAD to support construction illustrate the breadth of options available . The President of one firm bought hardware and software for CAD, put it on the site of a major project, and instructed the staff to find productive uses. Illustrating a completely opposite approach, a Field Engineer in another firm used his personal computer and software to demonstrate beneficial applications of CAD in preparing lift drawings and planning concrete placements. In other firms, the home office engineering staff or consultants took the actions needed to acquire the technology, implement it, and demonstrate the advantages. alternative designs. The magnitude of one US$52 million project encouraged the development of advanced falsework and formwork systems with almost 50 complete repetitions of the span-by-span construction of the 20.4 metre wide deck. The motivation to improve the processes for repeated operations enabled continual incremental improvements. This also placed the contractor in a commanding position for future similar contracts. In an example of sourcing implicit technology (represented by knowledge or skills embodied in people), another construction firm took over the key staff from a retiring specialist subcontractor when they made the strategic decision to merge piledriving into their own existing structural concrete construction capabilities. Experienced (and committed) skilled labour was therefore smoothly integrated into their own organisation, with the benefit of having witnessed the skills and work attitudes of the new employees over a decade of close industry involvement. transporting and setting heavy equipment , and automated welding machines for large plate work and high pressure piping. For each of these technologies, several firms have developed a core competence and applied the technology to perform work that others cannot perform or to gain substantial schedule and cost advantages. Another example reflects the potential benefits gained through the scope of abilities embodied in the firm's people or through strategic alliances with external professionals. Strong in-house engineering skills, for instance, can reveal opportunities available through optimising falsework materials, and through redesigns under value engineering schemes. One highway construction firm has demonstrated a successful integration of site project control through the on-site application of computer project programming and job costing. The progress of job sectors or individual operations can be tracked almost daily to allow potential problems to be highlighted and corrections applied, before they significantly impact project success. 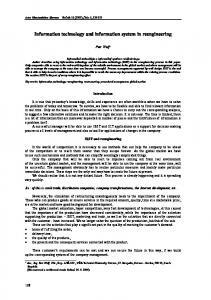 Depth of Technology Strategy Construction applications of CAD illustrated variations in depth of technology strategy. The commitment and level of resources ranged from a major investment in multiple high-end workstations for one project, to purchase of software compatible with the low-end personal computers designated for administrative use at the site . The core technologies identified above illustrate the increased depth necessary to achieve distinctive competence. production-oriented and trade experienced supervision based on site—with technical expertise, e.g. structural engineering—based in the home office, but allocated to specific projects and readily accessible by phone, fax, or radio (potential for video communication for future). In this manner, the depth of professional skills based at head office can be effectively spread over a number of projects, thereby lowering job overheads. Expenditure on R&D in the formal sense is minimal in the highway infrastructure firms surveyed. However, in a similar way that Nam and Tatum  have reported in their evaluation of the source of key technical ideas, a substantial number of innovations and enhanced project automation or mechanisation comes from informal R&D activities described "as a clever collection, transfer, or improvement of already-known technologies". The innovative investment in the trussed falsework system for double decking freeways is an example of more advanced construction process hardware developed in this fashion. Hampson and Fischer  provide a detailed review of the structural designs and construction technologies in this important highway bridge construction sector. Several examples of construction innovation from heavy and building construction illustrate the importance of the organisation in creating the environment necessary for technical change [24, 25]. Key actions in organising for innovation include establishing supportive policies and priorities, maintaining flexibility in grouping and providing technical resources, facilitating intra- and interorganisational co-ordination, and staffing to satisfy specific requirements for key positions . Further, linking personal reward structures to the technological objectives of the firm serves as a powerful signal to employees . Examples of CAD applications on construction sites illustrate the types of organisational environments that foster the adoption of new technology. These included strong support by senior managers, established technical excellence in the firm, and willingness to allow experimentation with new approaches. These innovative organisations lacked rigid structure and position descriptions, fostered individual initiative and experimentation, and included several types of champions . More successful infrastructure construction companies demonstrate a number of consistent organisational characteristics including: strong personal involvement by senior managers, an established core of technical competence in the firm (either at the home office or on site), personal and group reward structures that reflect productivity and safety improvements, and personal communication networks unimpeded by either project location or organisational responsibility. automation and mechanisation is of paramount importance to enhance company performance in this competitive environment. Hampson  provides a detailed description of the application of this technology strategy framework to an infrastructure construction sector and rigorously analyses one firm using these dimensions. A Framework for Integrating Technology Strategy into the Firm Figure 1 illustrates a possible framework for integrating the five key dimensions of technology strategy into a firm’s structure. This framework may be best suited to a large organisation with a central core of technical competence. Alternatively, the structure shown in Figure 2 may be more appropriate for a smaller and more technically diverse organisation, or a blend between these two possibilities may be most suited. Either way, careful consideration of the five elements of technology strategy—competitive positioning, sourcing of technology, scope of technology, depth of technology strategy and organisational fit—by managers can provide benefits for the construction firm. examples of its application to the integration of CAD, co-ordinate positioning, and site mechanisation in construction activities. The five key dimensions to be considered in formulating an appropriate technology strategy are: competitive positioning, sourcing of technology, scope of technology, depth of technology strategy and organisational fit. Through selecting a strategy that best suits the existing capabilities of a firm, and addressing the construction sector market forces, managers can be better prepared to face the increasingly competitive environment in which they operate. Formulating a technology strategy cannot guarantee market success. But the diligent application and implementation of the technology strategy concept can provide the foundation for the creation of substantial competitive advantage. 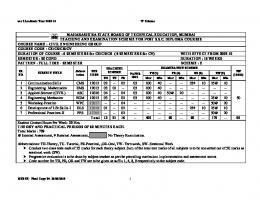 Tatum, C. B., "Classification System for Construction Technology," Journal of Construction Engineering and Management, ASCE, Vol. 114, No. 3, September, 1988, pp344-363. Glueck, W.F., Strategic Management and Business Policy, McGraw-Hill, NY, 1980. 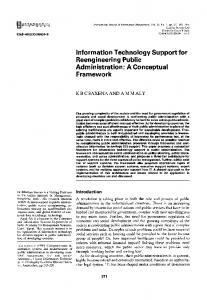 Chandler, A.D., Strategy and Structure, MIT Press, Cambridge, MA, 1962, p13. Adler, Paul S, "Technology Strategy: A Guide to the Literatures", in Research on Technological Innovation, Management and Policy, Rosenbloom, Richard S. and Burgelman, Robert A. (eds), Vol 4, JAI Press, Greenwich, CT, 1989, pp25-151. Andrews, K.R., The Concept of Corporate Strategy, Homewood, IL, Irwin, 1980. Ansoff, H. Igor and Stewart, John M., "Strategies for a Technology-Based Business" in Harvard Business Review, Nov/Dec, 1967, pp71-80. Freeman, Christopher, The Economics of Industrial Innovation, 2nd ed., MIT Press, Cambridge MA, 1982. Maidique, M.A. and Patch, P., "Corporate Strategy and Technological Policy", in Tushman, M.L. and Moore, W.L. (eds), Readings in the Management of Innovation, 2nd ed, Ballinger, 1988, pp236-248. Burgelman, Robert A. and Rosenbloom, Richard S., "Technology Strategy: An Evolutionary Process Perspective" in Rosenbloom, R.S. and Burgelman, R.A., (eds), Research on Technological Innovation, Management and Policy, Vol 4, Greenwich, CT, JAI Press, 1989. Malekzadeh, Ali R.; Bickford, Deborah J. and Spital, Francis C., "Integrating Environment, Competitive Strategy, and Structure with Technology Strategy: The Strategic Configurations", Academy of Management 49th Annual Meeting, Washington DC, August, 1989. Porter, Michael E., Competitive Advantage: Creating and Sustaining Superior Performance, Free Press, New York, NY, 1985. Rosenberg, N.; Ince, P., Skog, K. and Plantinga, A., "Understanding the Adoption of New Technology in the Forest Products Industry, Forest Products Journal, Vol 40, Iss 10, October, 1990, pp15-22. Mansfield, Edwin, "Composition of R&D Expenditures: Relationship to Size of Firm, Concentration and Innovative Output", The Review of Economics and Statistics, Vol 18, Iss 4, November 1981, pp610-615. Burgelman, Robert A. and Sayles, Leonard R., Inside Corporate Innovation: Strategy, Structure, and Management Skills, The Free Press, New York, NY, 1986. Tatum, C. B., "Design and Construction Automation: Competitive Advantages and Management Challenges," Proceedings of the 6th International Symposium on Automation and Robotics in Construction, San Francisco, June 6-8, 1989, pp332-339. Mahoney, John J., C. B. Tatum, and Kenji Kishi, "Construction Site Applications of CAD," Technical Report No. 36, Center for Integrated Facility Engineering, Stanford University, Stanford, California, October, 1990. Tatum, C. B. and A. T. Funke, "Partially-Automated Grading: A Construction Process Innovation," Journal of Construction Engineering and Management, ASCE, Vol. 114, No. 1, March, 1988, pp19-35. Stewart, William S., and C. B. Tatum, "Segmental Placement of the Renton Outfall: A Construction Innovation," Journal of Construction Engineering and Management, ASCE, Vol. 114, No. 3, September, 1988, pp390-407. Tatum, C. B., "Heavy Rigging for Nuclear Projects," Journal of Construction Engineering and Management, ASCE, Vol. 109, No. 1, March, 1983, pp48-60. Nam, C. H., and C. B. Tatum, "Strategies for Technology Push: Lessons from Construction Innovations," Journal of Construction Engineering and Management, ASCE, Vol. 118, No. 3, September, 1992, pp507-524. Hampson, K. D., and Fischer, M. A., "Structural Designs and Construction Technologies for California Highway Bridges," Journal of Construction Engineering and Management, ASCE, pp269-275, September 1997. 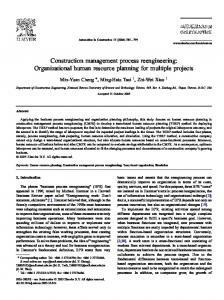 Tatum, C. B., "Organising to Increase Innovation in the Construction Firm, Journal of Construction Engineering and Management, ASCE, Vol. 115, No. 4, December, 1989, pp602-617. Nam, C. H., J. G. Gasiorowski, and C. B. Tatum, "Microlevel Study of Integration in High-Strength Concrete Innovation," Journal of Construction Engineering and Management, ASCE, Vol. 117, No. 2, June, 1991, pp294-309. Hampson, K. D., "Strategic Management of Technology in Dundee Construction", in Browne, M, Steane, P and Forster, J, Cases in Strategic Management, Macmillan Education Australia, 1998, pp223-242. Hampson, Keith D., Technology Strategy and Competitive Performance: A Study of Bridge Construction, Unpublished Doctoral Dissertation, Stanford University, CA, 1993. 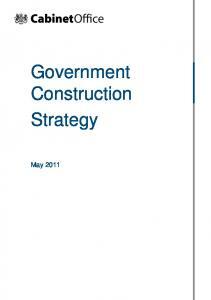 Report "Technology Strategy for Reengineering Design and Construction"